I had to dig into my archives to write this post. I have just finished setting up my new home and the mammoth task of organising my new kitchen. All the boxes are opened, sorted and done with. I really enjoyed doing up our home and I love the way the whole thing has come together. For those who know me in person, it is no secret that I’m fascinated with the entire process of planning, cooking and serving food. I love how my new kitchen has shaped up and how I have access to all the things that I need. My kitchen gadgets, cutlery, crockery, dinnerware and tableware are all in place and I just can’t wait to set my kitchen fires blazing. There are a number of dishes that I really want to cook up immediately as time and circumstance permits. At times I wonder about how I could have put the time I had when my precious infant who takes the major chunk of my day was not yet in my life. Now everything else seems to be playing second fiddle to the star in my life. This spicy ginger yogurt is yet another of my mother’s creation. She is a spontaneous cook who fixes food on the spur of the moment within a few minutes with the available ingredients on hand . She assembled this quickly one afternoon made with the yogurt sold in clay pots and wanted it to appear on divinetaste. After I tasted it I couldnt wait to execute it. The yogurt set in clay pots has an unmatchable earthy taste and aroma which cannot be replicated with yogurt set in other containers. I could simply eat it as it is! The ginger yogurt is so easy to assemble and tastes delicious. It can be a wonderful accompaniment to any Indian rice meal. 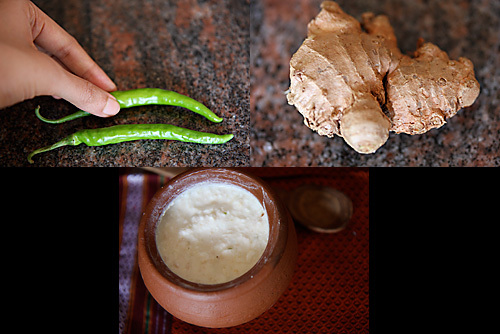 According to Ayurveda, ginger is heating to the body. Here it perfectly balances the coolness of the yogurt. Ginger is also an excellent digestive and adds zing to any meal. If I have a cold or a headache ginger always comes to my rescue. I’m very partial to ginger and I make sure that there is always some stacked up in my refrigerator. This is excellent with tomato and coconut rice or Jackfruit pulao. 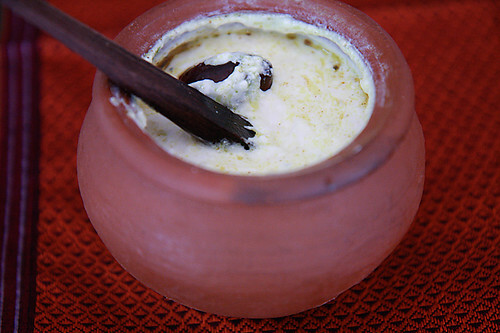 The yogurt sold in cute little mud/clay pots usually available in India is best for this simple dish. Greek yogurt or any thick yogurt should be an acceptable substitute for those who can’t lay their hands on clay pot yogurt. In a bowl place the yogurt and mix in the fresh ginger, salt and chilli paste. 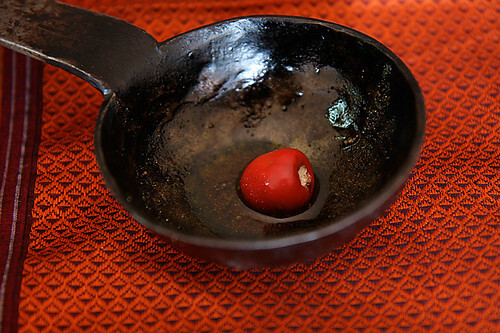 In a small wok, heat the oil. Pop in the mustard seeds and when they crackle, stir in the asafetida and dry red chilli. Pour the seasoning over the yogurt. Mix well and serve with the main course of your choice. Excellent dish. And the pictures even more captivating. Preethi: That sounds like a great idea. I have been on a sabbatical and let me do some real cooking to execute this idea of yours. But ill surely keep this in mind and work on it soon. Thank you for your inputs. Tried it and all of us simply loved it! 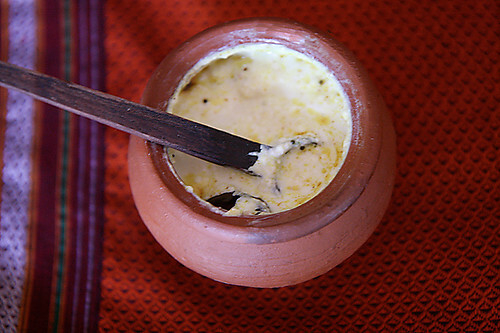 The ginger and curd taste so good together. A somewhat similar version is pachhe mor-koyambu (uncooked majjige huli). Fresh ground cocconut is also added to the curd. This looks delicious. I love the idea of serving it with the rice meal. I'm glad your unpacking process is going well. We just started and at the moment it feels like it will never end. Thanks for the recipe. If you refridgerate the yogurt for some time. It will taste even better. And this will be a great dish during summer. What do you say? Also garnish it with coriander. Finally done shifting? Wow. We need pictures, girl. You can't just describe things so wonderfully and not show it to us! Lol. And I love yoghurt in earthern pots, you're right, it just tastes so much better!